Botox $9.95 per unit ! Botox & filler appts can be made with short prior notice. Don’t wait. Call 206-368-1160 today. Sometimes even with vigorous exercise and weight loss programs, nothing seems to tighten and firm specific areas like the tummy, legs or arms the way we want. Downey Plastic Surgery offers a range of options to help smooth out stubborn fatty deposits or loose skin in these spots with safety and minimal discomfort. Downey Plastic Surgery practices highly individualized care based on patient needs, which are jointly identified during a thorough consultation and examination. Dr. Downey will discuss the treatment options available for body contouring and reshaping, and provide you a plan of care individualized for your unique situation. During this process, Dr. Downey will review the entire treatment journey with you, including anticipated results, possible risks and recovery expectations. This education gives balance to the relationship, and increases the likelihood of a satisfying outcome based upon mutually agreeable goals. Abdominoplasty or “Tummy Tuck” – More commonly known as a tummy tuck, abdominoplasty is a surgical procedure intended to smooth and flatten the lower abdominal wall. It is best suited for patients at or near their ideal body weight with unwanted loose skin, loose abdominal muscles or minimal excess fat. Mothers after childbirth or patients who have lost a moderate amount of weight are often good candidates for abdominoplasty. The procedure is typically performed under regional or general anesthesia and takes approximately three hours. During the operation, an incision is made level to the hipbones and the skin is detached from the abdominal wall. This skin is then drawn downward and the excess skin and attached fat is removed. The muscles in the abdominal wall area are then sewn with sutures that make the front of the stomach area feel flatter and smoother. Soft silicone drain tubes are placed under the skin to collect serum. The incision is closed and the bellybutton is restored to its original location. Dry dressings and an abdominal binder are applied to finish the operation. While most patients prefer an outpatient abdominoplasty, some people, particularly those with young children at home, or who are from out-of-town, choose to stay overnight in the hospital for comfort. The overnight care received within Northwest Hospital is personalized and a good value proposition for this group of patients. During recovery, you will likely experience some tightness and soreness in your stomach that is usually managed by pain medication. To avoid the risk of clotting or swelling in the legs, you should walk and keep your legs active, and avoid prolonged sitting or standing. Showering is permitted the next day after surgery, but you will not be able to drive for at least ten days. Any exercise involving the use of the abdominal muscles should be suspended for four to six weeks. While complications are uncommon with abdominoplasty, they could include bleeding, infection, scarring, numbness, over correction, residual loose skin, skin loss or blood clots in the legs or lungs. Liposuction – Liposuction is a surgical procedure that is intended to reduce localized collections of unwanted fat from the trunk, arms, legs, neck or chin. Most women consider liposuction for their lower abdomen, hips and inner/outer thighs. Common areas of consideration for men are their abdomen or “love handles.” Whatever the problem area, liposuction is most successful with patients close to their ideal body weight who have youthful, elastic skin and localized collections of unwanted fat. Depending on the extent of the fat to be removed, liposuction is typically performed on an outpatient basis using regional or local anesthetic and takes anywhere between thirty minutes to several hours. During the procedure, a weak mixture of local anesthetic and adrenaline is injected throughout the treated areas to reduce bruising and post-operation pain. This is called “tumescent solution”. Then small incisions are made in the treatment areas and the end of a hollow rod which is connected to a medical suction machine is placed into the fat pockets. As the rod is moved throughout the treatment area, the applied suction permits the fat to leave the fat pockets until their contour has been smoothed and sufficiently flattened. The incisions are then closed and an elastic compression garment is applied. After your surgery, your compression garment will need to be worn for a few weeks to help control swelling and bruising. You will experience some moderate soreness and discomfort in the treated area that is usually managed by pain medication. In most cases, patients are able to drive and return to work within a week of their surgery. Brisk exercise should be avoided for three to four weeks. While complications from liposuction are uncommon, they could include bleeding, infection, scarring, numbness, pigmentation, persistence of the original fullness or contour irregularities such as ripples, waves or dimples. Body Contouring Surgery After Major Weight Loss – Losing significant excess weight from diligent exercise, or operations like “lap-band” or gastric bypass procedure, can literally save a person’s life. An expected consequence of this major weight loss is the accumulation of excess skin on the trunk, breasts, arms or legs, which many patients understandably choose to remove. A “post-bariatric” body contouring procedure is meant to smooth the loose skin of the chest, abdomen, or back, tighten and smooth the skin of the arm or leg, and improve skin health and hygiene by eliminating redundant folds that accumulate perspiration. It is important that before a major body contouring operation is performed, a patient is at his or her target weight so that the tissue being removed is primarily loose skin. and as free of fat as possible. A thick layer of residual fat from persistent major obesity increases the rate of complications and limits the amount of skin and fat that can be effectively and safely removed. The actual procedure varies for each patient, depending on body needs. 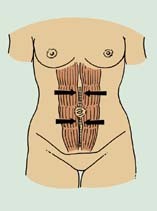 For severe weight loss, loose skin typically needs to be tailored from the abdomen, trunk, upper arms and inner thighs. After surgery, a silicone drain will be placed in the treated area to collect inflammatory serum, You will need to wear a compressive elastic garment to help control swelling. You will be encouraged to be up and walking shortly after you recover from anesthesia. Considering the extent of the procedure, the amount of pain most people experience is quite bearable because the operation manipulates only skin and fat, rather than muscle. You will be asked to change your dressing and shower daily, but will need to refrain from bathing until the drain tubes are removed. Patients with jobs that require a lot of sitting generally need to stay away from work for two to four weeks. Major complications with this type of body contouring operations are rare, but could include bleeding, infection, scarring, numbness, asymmetry, overcorrection, under correction, leg or lung clots, poor healing and persistent loose skin. As with all surgeries, risks increase with smoking, obesity, diabetes, age, and other medical conditions. You should discuss with us any medications, including natural or herbal remedies, to help avoid complications with your operation. Downey Plastic Surgery offers competitive pricing for your body contouring operations. We accept most major credit cards and will help coordinate with your insurance carrier whenever coverage is available. For elective cosmetic treatments, you will receive an estimate of fees during your initial consultation. Full payment for your procedure will be due at your pre-operative visit, which is usually two weeks prior to the surgery. For more information, please visit the Financial section of our web site.